Talisman? No, It's a Horoscope! Traditional Aspects: What's the Explanation? Algol: Respect the Sources & the Spirits! That in what house any execrable facts are committed, the ministring of Angels of God feeling the villany done in that house, and the dishonor done to God therein, doe accurse that place or house; which continues so long, as there is not a full expiation made by some godly person, for the sinnes committed in that house; or untill the time limited by the angry Angel be expired, the house shall remaine a most unfortunate house for any to live in: And this which I write, and is inflicted upon houses which are insensible, I assuredly know is preformed to the full upon the great and smaller Families of this world, &c.
How in a naturall way to discharge these curses, Sunt Sigilla & Lamina quae nec Scripta Sunt,& ego novi. The Latin roughly translates as, "There are sigils and lamens [ie talismans] which are not written and this I know"
This passing reference to talismans is telling because, in fact, Lilly was a frequent user of astrological talismans. 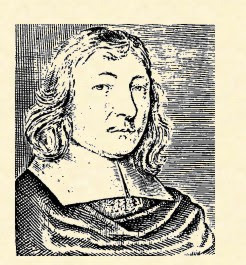 His friend, Elias Ashmole, Steward of the Society of Astrologers, received a trunkload of talismans from Lilly and described them as, "the greatest arcanas any private person in Europe hath..." cited in Thomas, Religion and the Decline of Magic, page 635. So we have a testimonial from William Lilly himself regarding the efficacy of talismans for curse removal! 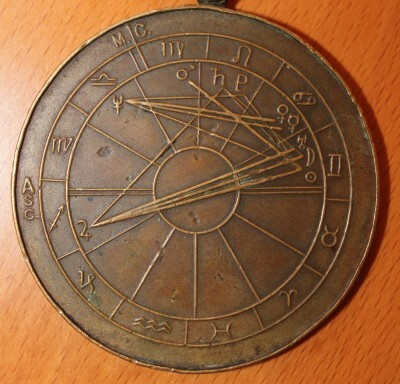 Because we specialize in astrological talismans at Renaissance Astrology, I often get e-mails from people with pictures attached asking me to identify talismans. Other than saying, "Well this looks early 20th century" generally I have no idea what the item is. However, today I got an e-mail with the picture above attached. The person asked what kind of talisman it was. Well, it's not a talisman! It is a horoscope! Likely someone's birthchart. Just for fun I decided to determine what the date was. I did this by starting with the slowest moving planet, since this chart is modern and includes Pluto, I looked to the signs it was in, Leo, so late 1940's, then I narrowed it down by looking at the sign each successively faster planet was in. So this is a horoscope for around Sunset on June 7, 1948. So, finally one I could figure out, very interesting! "The sextile is an aspect of moderate friendship, because the signs that aspect each other by this aspect agree in their active but not passive nature..." OK - so far, so good....the opposition is an aspect of perfect hatred, because the signs that so aspect each other are contrary in all four natural qualities". They found this confusing because this isn't true of the opposition! Ok, one of the things that will really frost your noodle is that there is no ultimate, 100% authoritative traditional source on pretty much anything. Sources will contradict each other and be internally inconsistent. Some times parts of traditional (and modern!) sources are just wrong. In terms of the reasoning behind the nature of the aspects, everyone agrees that the sextile and trine are benefic, the trine being the best. Square and opposition are malefic, opposition being the worst. Conjunction is not technically an aspect, because aspect means seeing or looking and when planets are in the same degree they don't see each other. Classic traditional info which you learn and then disregard since a conjunction in practice is treated like an aspect and is good with good planets, bad with the bad planets. But you must note that application by sextile or trine is good, for they are Aspects, of love, amity and Friendship; yet the trine is more forcible and better, for that a Planet in trine with another is out of houses of the one and the same nature, as fire with fire, earth with earth, water with water, and ayr with ayr. Let's look at some examples, if a planet is in Aries and aspects a planet in Leo, they are trine (we are going to be ignoring out of sign aspects for these examples). Aries is a fire sign, thus hot and dry, Leo is a fire sign, also hot and dry, thus they agree in both elemental qualities. Ok, Aries to Gemini, a sextile, fire = hot and dry, air = hot and wet, they agree in one of two elemental qualities. Aries to Cancer, square, Aries = fire = hot and dry, Cancer = water = cold and wet, they agree in no elemental quality. Ok, so far so good! Aries to Libra, opposition, fire = hot and dry, air = hot and wet, agree in one elemental quality, OPPS! the sequence breaks down! In fact, the basis of the aspects is not elemental qualities, but rather the traditional planetary rulerships of the signs. This everyone agrees on. Start with Leo and Cancer each ruled by the Sun & the Moon, one sign away is Gemini & Virgo, ruled by Mercury, not an aspect but Mercury is changeable anyway, good with the good, bad with the bad. 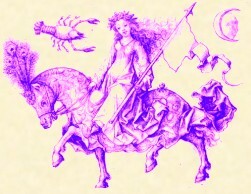 Two signs away, a sextile!, are Taurus & Libra, ruled by Venus, the Lesser Benefic, 3 signs away, square, are Aries and Scorpio, ruled by Mars, the Lesser malefic, 4 signs away, a trine, are Sagittarius and Pisces, ruled by Jupiter, the Greater Benefic and 6 signs away, the opposition, are Capricorn and Aquarius, ruled by Saturn, the Greater Malefic. Check out the handy diagram at the top left of this post. This explanation is internally consistent and accepted by every traditional source I've seen even if they have alternate explanations elsewhere. I had a poster ask whether having the Moon void of course was a problem in fixed star elections. Is the void of course Moon a big problem? Ok, this fits with my Mercury retrograde rap. Basically my view is that modern astrology is 100% positive with the exception of Mercury retrograde and the void of course Moon, two imports from traditional astrology. Thus by themselves Mercury retrograde and void of course Moon have to represent all by themselves all the BAD STUFF in the Cosmos and thus are considered to be APOCALYPTICALLY BAD!!! Now certainly these are afflictions in traditional astrology, but not the only ones and not the worst ones either. The medieval astrology Guido Bonatti lists the void of course Moon as just one of 17 different possible afflictions of the Moon. Consideration 5 146 Considerations. What do our traditional sources say about the severity of affliction of the Moon being void of course? Lilly says when the Moon is void of course, "you shall seldom see a businesse goe handsomely forward when she is so." Christian Astrology at 113. Not exactly a total disaster. Lilly also notes that, "All manner of matters go hardly on (except the principal significators be very strong) when the Moon is void of course. Yet somewhat she performs if void of course and either in Taurus, Cancer, Sagittarius or Pisces" Christian Astrology at 122. Again hardly a searing indictment of the void of course Moon and with several significant exceptions. So what is the deal with the void of course Moon? The Moon typically shows action and connection and if she isn't making any aspects this is an indication of a lack of action, which may or may not be positive depending on the situation. If you want the status quo to remain in place, void of course Moon would be good! "Now, the manner of making these kinds of rings [& talismans! ], is this, viz., when any star ascends fortunately, with the fortunate aspect or conjunction of the Moon, we must take a stone, and herb that is under that star, and fasten it under that star and make a ring of the metal that is suitable to this star, and in it fasten the stone, putting the herb or root under it; not omitting the inscription of images, names and characters, and also the proper suffimigations..."
Three Books of Occult Philosophy Bk.I, Chapter 47. 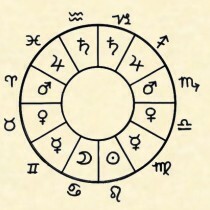 "And draw your attention to the Moon in all works [of magic] as if she were the chief of all the other planets because she brings about evident manifestations and judgments in all things in the world and it pertains to the power of generation and corruption and she is the mediatrix [female intermediary] in the advance of your work, receiving the influences and impressions of the stars and planets and pouring them out to the inferiors of this world. So, in the context of fixed star elections, the whole key to the election is that the Moon is applying to conjoin (or in a pinch trine or sextile) the fixed star! Now normally fixed stars don't count as far as being void of course, but here the Moon is in direct contact with the fixed star thus the void of course effect, ie lack of contact, is hardly a problem. I really have no idea what an "Algol transit" is. A transit generally means comparing the position of a planet or other astrological factor with the current chart. This has nothing to do with the process of how you elect times for anything, including talismans. I think you are referring to Algol culminating??? More importantly, what's this about leaving the talisman somewhere? There are specific talismans in our sources that you leave in spots where you want them to take effect. Thabit Ibn Qurra in De Imaginibus, published as Astral High Magic describes a number of these talismans. However, generally they are also keyed to the rising sign or even rising degree of the intended recipient, whether for good or for ill. This is the exception, however, with most talismans if you want a positive effect for yourself, you wear, carry or at least keep the talisman around. But what does Agrippa say about Algol talismans? Under the head of Algol, they made an image whose Figure was the head of a man with a bloody neck; they report that it bestoweth good success to Petitions, and maketh him who carrieth it bold and magnanimous, and preserveth the members of the body sound: also it helpeth against Witchcraft, and reflecteth evil indeavors and wicked incantations upon our adversaries. Three Books of Occult Philosophy Bk II ch 47. "and maketh him who carrieth it..." ie in modern English, "and makes whoever carries it, etc. etc." So let's see, the election is probably ok, but we've got leaving the talisman somewhere when the sources say to carry it with you or at least have it around and we are dealing with ALGOL!!!! 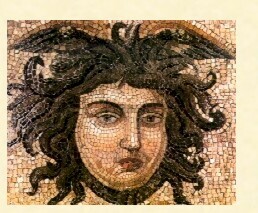 This is the Head of the Medusa, the fixed star with the absolute worst reputation, the most malefic of all. But, if treated respectfully puts all that malefic energy outwards against your enemies. Still without a doubt Algol is the worst fixed star to be messing about with. Algol is rambunctious even when you are respectful and follow the instructions in our traditional sources carefully. One effect and this I have experienced myself is that when you first start working with Algol he/she causes electronic problems and in particular interrupts your Internet connection. I had my electronic thermostat blow and my Internet mysteriously go down for 45 minutes the first day I used Algol. Others have reported that "weird" or "malevolent" looking people took one look and ran away when users worn their Algol talismans. Algol is most definitely the fixed star with the most obvious effects. Very, very powerful spirit is Algol, but it looks like he/she does not appreciate having their talismans left lying about. No wonder you had trouble! Folks, I can't emphasize how much of a mistake it is to start making stuff up and mixing and matching in the finest New Age style. You might be able to get away with basically disrespecting other astrological spirits or maybe the effects would be less obvious, but Algol is IN YOUR FACE! On the other hand we have had almost unanimously positive reports from those that got Renaissance Astrology Algol talismans and followed the proper election and ritual for personal consecrations.